I can't believe I'd forgotten how much I love witches! I have ever since I was a kid and never stopped wishing I could be one myself! Also, YAY ADULT PARANORMAL ROMANCE!! I was a bit hesitant going into this one, I'd heard really good things about it, but the sheer size of this book was somewhat scary. That's 722 pages I was committing to and with my limited time to spend on reading these days, it just has to be worth it. I needed about 30 pages to get into this story, but after that it all went smoothly and I found myself thinking about all these characters and the things that were happening even when I wasn't reading it. And yes, that is a VERY good sign! I really liked Diana and Matthew. I loved how their relationship develops and the sweet moments between them mixed in with the clashing of their personalities and creature-specific traits. It wouldn't have been believable if a vampire who has lived for many, MANY lifetimes and a modern witch would have just matched without any challenge whatsoever. I love that not everything runs smoothly! I love that both were flawed and felt real. Even though it did sorta creep me out for a minute when I discovered how old Matthew really is... But I got over that pretty quickly. I love the creature-lore with the three different species: vampires, witches and daemons. I love that we're not dealing with stereotypical vampires and I giggled at some of the mentions of famous historical figures actually being creatures! 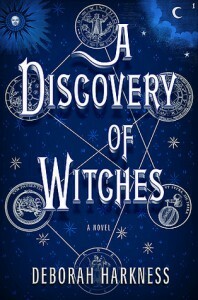 I also loved that Deborah Harkness has a magic system in which there's a difference between magic and witchcraft! The way she explains it feels right to me somehow! Though A Discovery of Witches takes its time to get to the excitement, I was never once bored. I didn't feel like the pace was too slow, it felt like a leisurely stroll through a beautiful world I could I could take my time to get to know. I love that I feel like I really know the characters now, it's one of the things I enjoy most about reading longer books and series. And there were a lot of characters for me to cry for, be happy for, laugh with and just basically root for. I can't believe it took me this long to read A Discovery of Witches and I'm so glad I have the sequel Shadow of Night on my eReader that I actually started reading right after finishing this one! Recommended for all you fans of witches and paranormal romance!